2008 HAAS SL-30 CNC LATHE WITH LIVE TOOL MILLING, 10” CHUCK, 3” BAR CAPACITY, CHIP CONVEYOR, 30 HP 2 SPEED GEAR DRIVE, TAIL STOCK, TOOL PRESETTER, 12 POSITION TURRET, S/N 308797. MAZAK VQC-20 BRIDGE TYPE 4 AXIS CNC VMC, WITH MEZATROL CAM-M-2 CONTROL, 5000 RPM, 30 ATC, BT-40 TOOL HOLDER, (40x20x18) XYZ, TAABLE SIZE 49”x20”, WITH MATSUMOTO 4th AXIS ROTARY MODEL MDB-232. 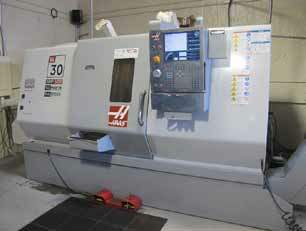 1997 COMET CNC VMC, MODEL VMC-850, 8000 RPM, MITSUBISHI CONTROL, 20 ATC, 40 TAPER, S/N 000886. BROWN AND SHARP MICRO VAL CMM, WITH MICROMEASURE III SOFTWARE AND RENISHAW MIP PROBE AND FULL CABINET AND STAND. CNC VERTICAL GUN DRILL, WITH MACH3 CNC CONTROL, 21” VERTICAL STROKE, FOR GUN DRILLING AIRPLANE HINGES. HARRISON 15” x 40” ENGINE LATHE WITH 5C COLLET, 3 JAW CHUCK, 4 JAW CHUCK. BRIDGEPORT VERTICAL MILL WITH 2HP, DRO, POWER FEED, CHROME WAYS. 2003 MSC HORIZONTAL BAND SAW. CHAMPION 5 HP AIR COMPRESSOR, GRINDERS, TOOL CABINETS AND ETC. CLARK 4000 LB LPG FORKLIFT.